Take some corn tortillas (buy the ones with the least amount of ingredients at the store) and soften them in the microwave for a few seconds (to prevent cracking when you roll them). Put 2 tablespoons of chicken down the middle of each tortilla. Add one tablespoon of grated cheese. Roll them up and stick with a toothpick (to hold closed until they are cooked). Heat about 1/2 cup of oil in a deep frying pan. (Note: I used coconut oil and it didn’t work well…the taquitos weren’t crispy and seemed to soak up too much of the oil. I would just use canola oil as it cooks things nicely and won’t hurt this once right?). Once hot, cook the taquitos until brown all over. 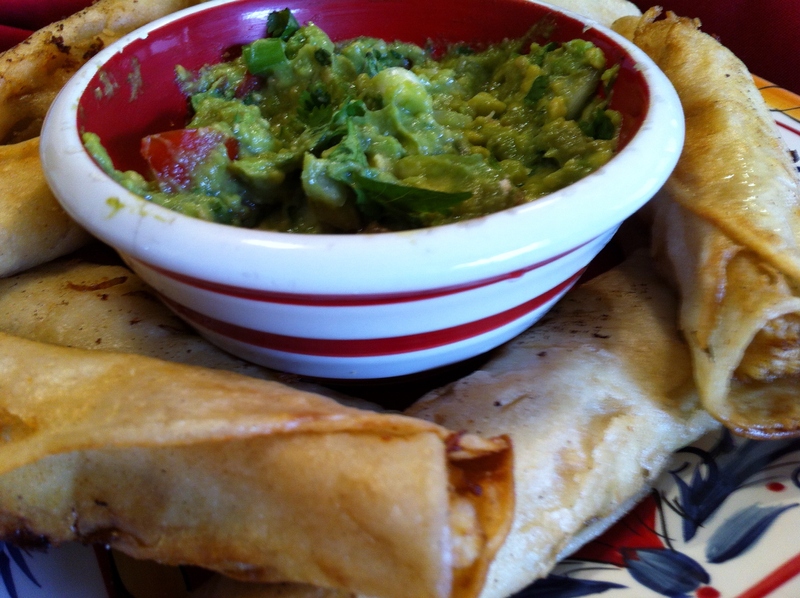 Serve with guacamole (see recipe below). Or, for a lighter option, lay rolled taquitos out on a cookie sheet. Spray with “Pam” and bake in a 400 degree oven until warm and crispy. After school snack idea: Freeze taquitos and let kids remove a couple and heat in the microwave for 30-60 seconds. Cut avocados in half lengthwise. Remove pit and peel. Put into a bowl. Squish with the back of a fork. Stir in chopped tomato, onion and the juice of one lime. Stir in chopped cilantro and season to taste. Store in the refrigerator until ready to serve. For a little kick, add a couple of drops of hot sauce or a dash of chili flakes.